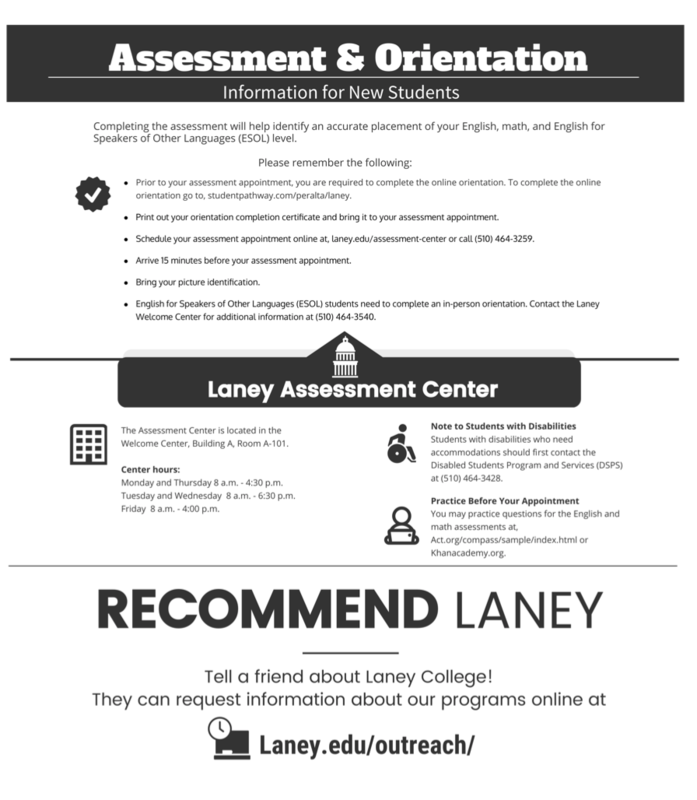 Welcome to the Laney College Assessment Center! As of Spring 2019 Assessment Testing is no longer required before enrollment into English or math courses, if you have graduated from a regionally accredited United States high school and already applied to Laney College or completed the prerequisite course/courses at another college or university please see the following. • Highest level of coursework completed in a subject area and corresponding course grade. The English as a Second Language (ESOL) Assessment. 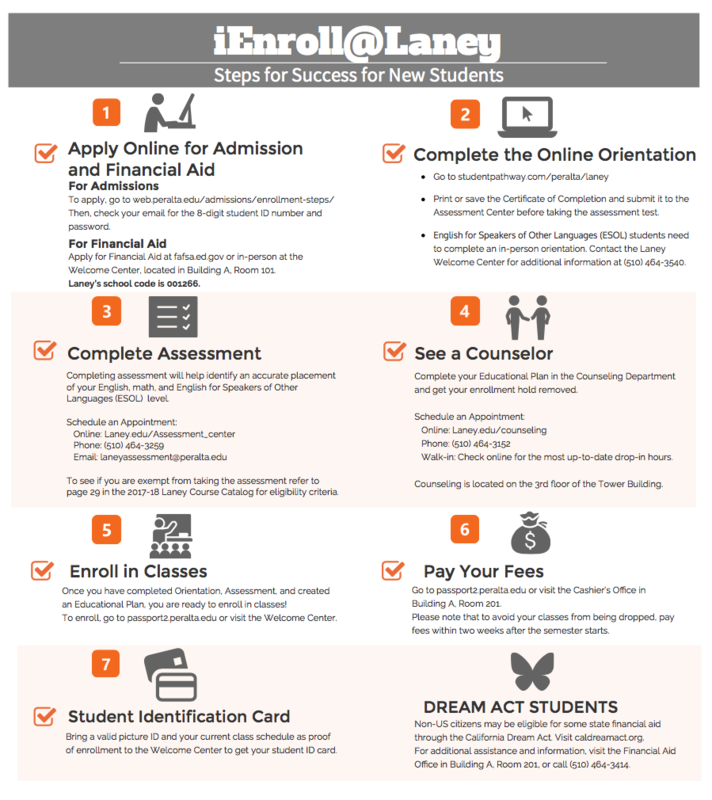 Assessment is one of the most important steps in the enrollment process. At Laney College, we want to help you succeed and part of your success as a college student depends on enrolling in courses that match your abilities and skills. Testing is recommended before enrollment into any ESL courses. While the ESOL Assessments are taken on a computer, the ESL written test is not computerized at this time. If you are taking the ESOL Assessment, please allow up to 2 – 3 hours to complete the process. Check the testing schedule before you make an appointment to take your assessment test. Students needing or wishing to take Chemistry 1A must make an assessment appointment. Click here for the dates to take your Chemistry 1A assessment. Once you know the day and time of the Assessment test you want to take, go ahead and make an appointment by phone, online, email, or in person. All students must bring an unofficial transcript from their last High School or College. Please bring the receipt of your completed on-line orientation. All ESOL students must arrive 15 minutes before the test. You must bring valid identification with you on the day of your assessment and orientation. No visitors or children are allowed in the Testing Area during the testing session. No Food/Drinks are permitted in the Testing Area. All electronic devises (i.e. cell phones, tablets, laptops, calculations, etc.) must be turned off during orientation and testing period. Assessment results so not keep anyone from enrolling in college or any college program however, students must meet prerequisites as stated in the college catalog. NOTE: You cannot “fail” the assessment tests or be denied admission to the college. The tests are a measurement of current skill level only, not of intelligence or aptitude. There is no cost for the assessment or orientation. Assessment Center in Advance to arrange for accommodations. 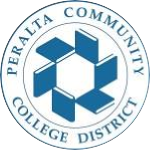 For more information please contact us at laneyassessment@peralta.edu or call (510) 464-3259.